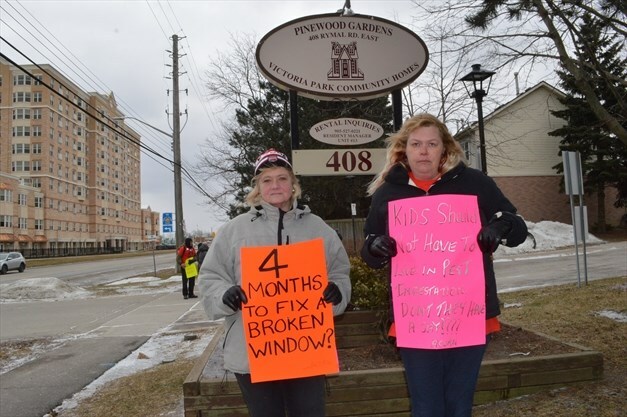 Friday afternoon’s frigid wind and swirling snow didn’t stop about a dozen people from protesting what they say are the poor conditions in some of the units at Pinewood Gardens at 408 Rymal Road East next to the Mountain police station. The property is owned by Victoria Park Community Homes, a Hamilton nonprofit organization and the protest was organized by Hamilton Acorn, a tenants’ rights group, and included four residents from the townhouse complex that features 50 market and subsidized rental units. “We just don’t get repairs done,” said Denise Jones, who lives in unit 36. Jones said she’s afraid her second floor toilet it going to come crashing through the ceiling. Jones added she has seen black mould in her home and the first floor is so “spongy” that she’s afraid she’s going to put a foot through it. Shelly Keenan who lives in unit 31 said she has a rodent problem. “I’ve been infested with rats and mice since mid-November,” she said, adding some second-floor carets are stained with rodent urine and feces and rat poison. Dan Deuce, the on-site resident manager for VPCH, said he was first told about the rodent problem in December and immediately sought a work order to get the matter resolved. He said a pest control company people visited the property four times, adding pest control treatment was applied to a block of units 31-34. Zaeem said they examine each matter and judge if it is a legitimate concern or something that can wait. Regarding the black mould, Zaeem said they have had the unit inspected and a discoloured area under a sink was determined not to be mould. Zaeem said the discolouring could have been caused by a number of things including chlorine, adding from his experience tenants often confuse discolouring with mould. He noted VPCH executive director Lori-Anne Gage has offered to meet with Acorn officials about the issues at 408 Rymal and they are hoping to organize a meeting next week. The tenants are not contemplating withholding their rent at this time.